A list of some common questions and answers regarding liquid soap based on my research and experiences making liquid soap. Q: How do I determine the pH of my soap and what should it really be? A: What is pH? 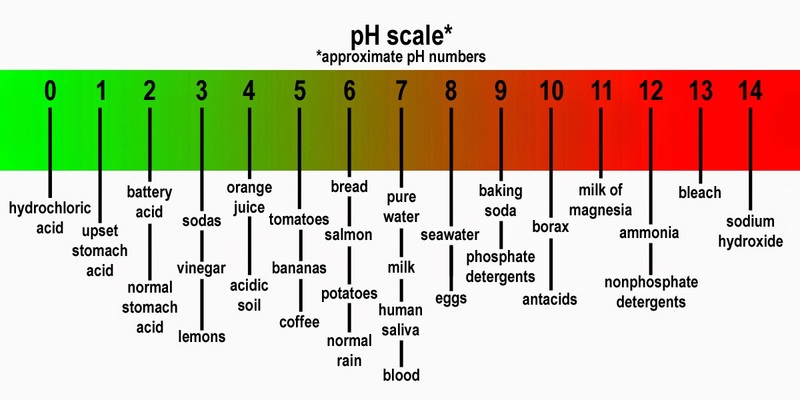 In basic terms, pH is a figure expressing the acidity or alkalinity of a solution on a logarithmic scale on which 7 is neutral, lower values are more acid, and higher values more alkaline. The scale measures from 1 - 14, 1 being most acidic, 14 being most basic. Liquid soap in an alkaline product and is meant to be an alkaline product with a pH typically in the range of 9 - 10.2. Trying to lower your pH below 9 or even around 9 and your soap begins to destabilize. It will start reverting into water, glycerin (a by-product of saponification), fatty acids, soap content (which will reduce more and more the lower you take your pH) and whatever acid was used to alter the pH. A very common pH adjuster for liquid soap is Citric Acid, so if that was used, you would have Potassium Citrate as part of your solution too. In order to properly measure the pH of your soap, you need to do so in a very diluted solution. It is quite easy to get false pH readings in a) soap that is not room temperature, unless your meter is advanced enough to account for temperature and b) concentration. The more concentrated your diluted soap is, the higher the incidence of a false pH reading that will be lower than the actual pH of your soap. If your best bet is to make a 1% solution of soap paste to distilled water and use that as your test solution. While this may not be standard under commercial testing facilities/manufacturers, it should be quite accurate enough for the home crafter or small business manufacturer. Since water will have the same density and weight, you can measure by weight. Take 99 grams of distilled water and dissolve 1 gram of soap paste into that. Use this solution to measure your pH at room temperature. For comparison purposes, also measure your fully diluted and finished soap from the same batch without diluting further to see the differences and potential false reading. Taking a reading from a concentrated soap sample is like trying to see through a fog, while in the more diluted sample, it is like viewing it on a clear day. Digital meters are far more accurate than pH strips or Litmus test papers which can be off by 1 - 1.5 points and can only give you range which is not always helpful when troubleshooting soaping problems that may be due to pH. There will be a full post on testing pH in the near future. Q: My perfectly clear soap turned cloudy, has white spots floating in it or white streaking. A: This is typically due to temperature changes and the cloud point of your liquid soap. Cloud point is the temperature at which the dissolved solids in your liquid soap will start to solidify and precipitate out of solution and begin to turn your lovely clear soap opaque or cloudy. This can look like little droplets of white, white streaking or ghosting, general cloudiness or a completely opaque soap. Warming the soap up should remove the cloudiness and bring your soap back to its clear state. There are many variables that will affect the cloud point of your soap including ingredients and additives. Some soaps will cloud at temperatures that other soaps will not - no two soap formulations will act the same. In my experience, the simpler the ingredients with the fewest additives, the lower the cloud point temperature - fewer ingredients to precipitate out of solution. Q: Do I need a preservative for liquid soap? A: Using a preservative in liquid soap can be a personal choice. Many people think that the higher pH of liquid soap negates the need for preservative use as many molds, fungi and yeast will not grow in high pH products. Bacteria, though may develop in higher pH products - and this you will not see visually through the naked eye. The rule of thumb is if your soap pH is 10 or above, no preservative is needed, below 10 you will want to consider a preservative. Since many people are attempting to lower the pH of their soaps through the use of pH adjusters (citric acid for example). The lower the pH, the more hospitable the environment for those undesirables developing in your soap. You also need to consider any additives that you add to your soap. Many additives are considered "bug food" and will increase the likelihood of those undesirables developing in your soap. Proteins, some extracts, using any food product (milks, teas, coffees) as part of your dilution, etc. All of these ingredients will increase the chance of things developing in your soap that you don't want in there. Q: How can I make my soap thicker, it is too thin? A: The viscosity of your soap will depend on many things including your chosen oils, dilution rate and any additives you choose to add after dilution. Two things should be considered when diluting your soap paste 1) The overall concentration of your soap (the lower your dilution rate, the higher your soap concentration - too a high a concentration can be harsh for some people and you must adjust usage accordingly) and 2) Overall viscosity - some of this can be controlled via dilution rate other times you may need a thickener to increase your viscosity. I have several posts on this blog about thickening liquid soap. Q: What is neutralization and do I need to do that step? A: There are two main methods for making liquid soap. One formulates with a lye excess and that lye excess is then "neutralized" after you dilute your soap. Please note that the term neutralization in making liquid soap does not refer to a neutral pH (7.0) but the act of removing any excess lye that may be present. This method insures that all oils are saponified and you get the clearest soap possible (depending on your choice of oils) but requires the use of buffering agents (borax) or pH adjusters (citric acid) to react with that excess lye so that it is no longer present in your soap. Using too much of any neutralizing agent can cause problems so be careful and understand how to use them properly. The second method is to formulate with a 0% superfat or a slight superfat (up to 3% or so). This method does not use a lye excess and if all ingredients are measured accurately, will not require neutralization and result in an overall soap pH between 9 - 10 which is perfect for liquid soap. This method is great for those who do not want to add any neutralizing agents and still have a nice clear soap (again this is also dependent on the oils you choose). The downside to this is in the purity of your lye and you need to insure that your lye purity is what you think so you don't inadvertently use too little and end up with too much superfat that will affect your clarity. Unsaponified oils will eventually separate out of your soap and float to the surface. Both methods have their advantages and disadvantages and it is really personal choice as to which you want to use. Q: What is a Fragrance/Essential Oil flashpoint and do I need to worry about losing scent based on the flashpoint of the FO or EO? A: The flashpoint of a fragrance or essential oil is the temperature at which point it becomes combustible if exposed to a spark or flame. The flashpoint is generally only important for those making gel candles and for determining shipping methods for the oil itself. The flashpoint has nothing to do with whether or not the scent will be affected (aromatic volatility). This is where aromatic volatility comes into play - how heat can affect the aromatic quality of your FO/EO. Flashpoint and aromatic volatility are not the same and it is the aromatic volatility that will determine if the temperature of your soap will affect the FO or EO you decide to add. A fragrance can have a low flashpoint but perform wonderfully in your soap or a fragrance can have a high flashpoint and completely dissipate in your soap - they do not always correlate. Determining aromatic volatility is really a trial and error approach unless the supplier indicates such information. Q: How do I label my liquid soap properly? A: You need to check with the appropriate soap and cosmetic regulation department in your country. Here in the US, soap and cosmetics labeling and safety are overseen by the CPSC (Consumer Product Safety Commission) and the FDA (Food and Drug Administration). A note on sample sized products. I have spoken with Marie Gale who is the most knowledgeable individual when it comes to product labeling and here is what she has stated bout labeling sample size products. 1. If the sample size is a size that you normally sell, you must follow all the labeling laws even if it is given out as a free sample. 2. If your sample is not in a size you normally sell the product in, you do not need to follow the full labeling laws UNELSS it is a free gift with purchase. If the sample is given based on the purchase of another product, it must then be labeled according to the appropriate labeling laws because a required purchase was made. But be aware that many people have allergies and it is always a good idea to list your ingredietns for the benefit of your customers. THIS is an awesome post. Saving it to link when newbies ask these questions. Thank you!